Where is your chin' s favorite place to sleep? Mine doesn't like sleeping in hanging fleece. 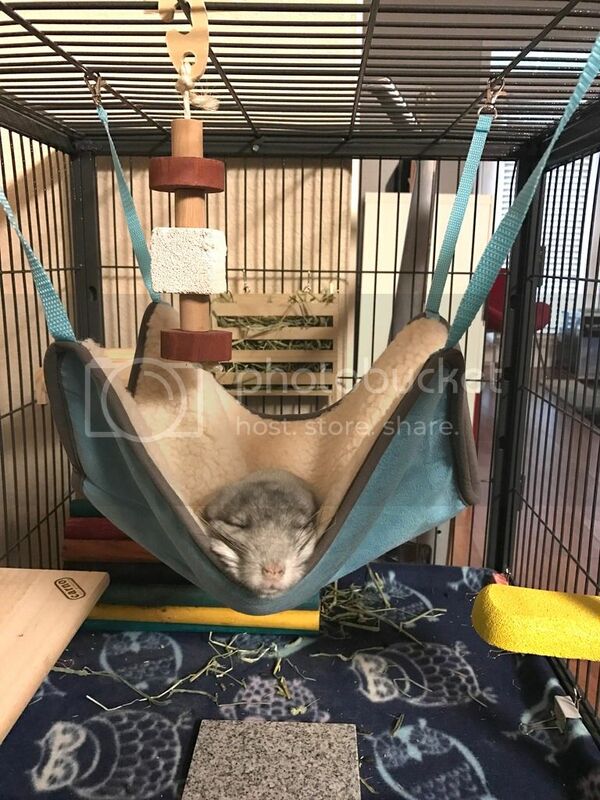 I've never seen him sleep in his hanging fleece house or hammock. His favorite bed is in his wooden hut. So what's your chinnies favorite hangout? Is there anything they dislike/won't sleep in? ^Mine doesn't like sleeping in anything 'loose' either. That one also won't sleep in houses. The only place he comfortably sleeps is his tube. My other one prefers the tube but he will sleep everywhere. 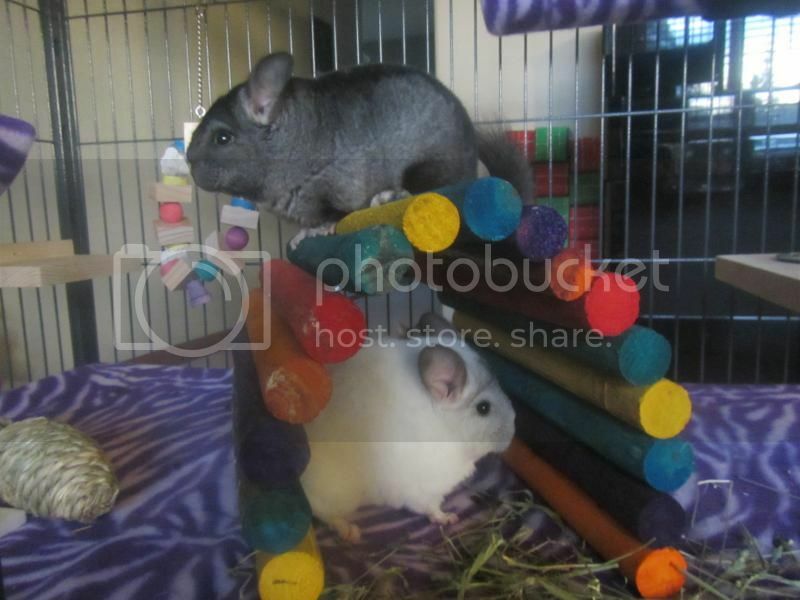 ChillyBean, a light ebony chinchilla. Baybay, a handsome white kitty. ...and Crowley, a satanic little kitten. Both of mine cuddle up together in their hanging hidey house. I've never seen them sleep anywhere else for any length of time. Aww, that sounds adorable!! Eli will sit in his hidey house to chew a piece of wood or something, so at least he goes in it somewhat. Maybe one day he'll decide to sleep in it. He is also a fan of fleece covered tubes. I see him in there pretty often. It seems to depend on the time of day and the temp. Most of the time they sleep in their hut, but in the afternoon they are almost always on the top ledge sleeping where their top food bowl is (waiting for dinner as soon as they wake). They are normally also on a ledge more if it's warmer in the room. They do occasionally sleep in the hammocks but not as often as they use to. All my boys are different. Wooden nest boxes, tubes, shelves and hanging houses are all favourites. The three boys who live together will start in the fleece hanger, and then all migrate to a shelf and then to the wooden nest box. Zulu likes to sleep on his fleece cover with his head resting against his pellet bowl, or on top of his nest box. Salt often sleeps on top of his fleece hanger. Proud Chin Parent to :- Pepper Jason Chilli Salt Tigger Ziggy Zulu Mark Merlin Angus Dougal Storm Zeus, Vulcan and Flint. If there are no chinchillas in Heaven, then,when I die, I want to go where they are! 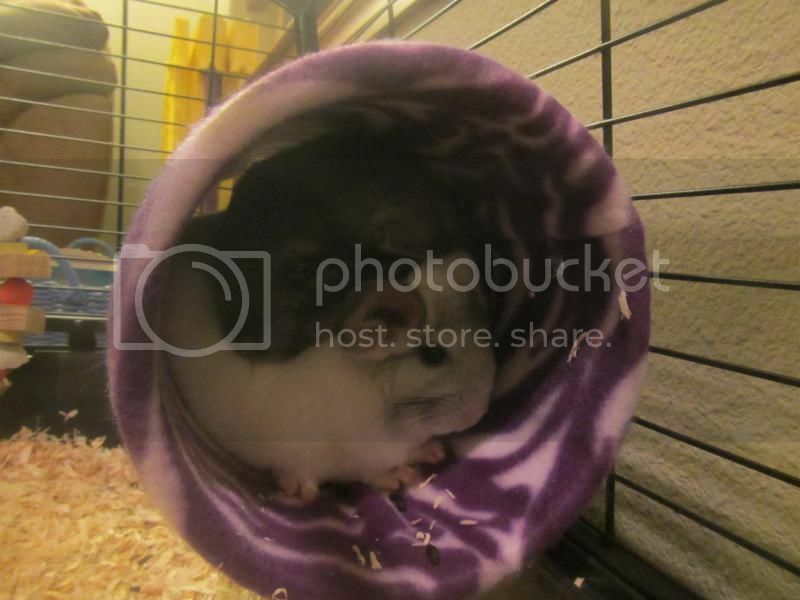 My girls definitely prefer the fleece tube! That is the favorite/coveted place to nap for each of the girls. 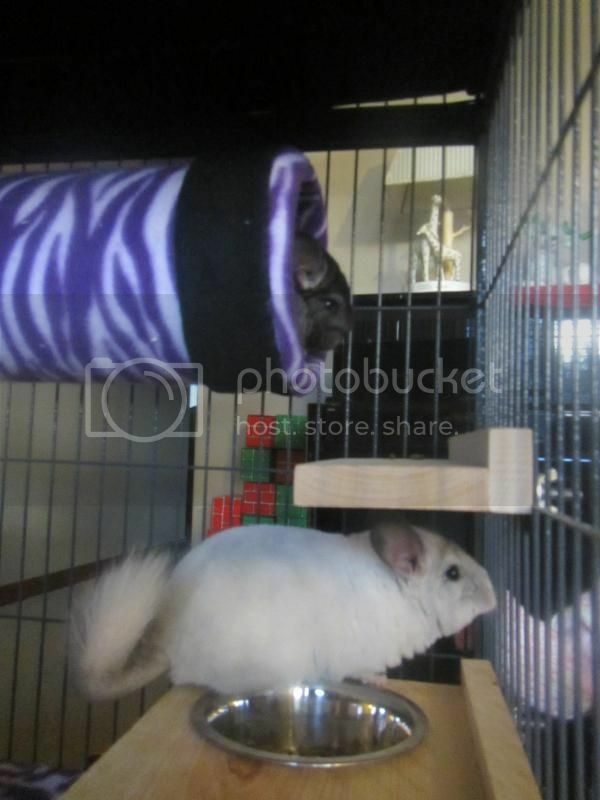 3 chinchillas: Blizzard - white mosaic, Belle - medium ebony & Violet - she's a violet! 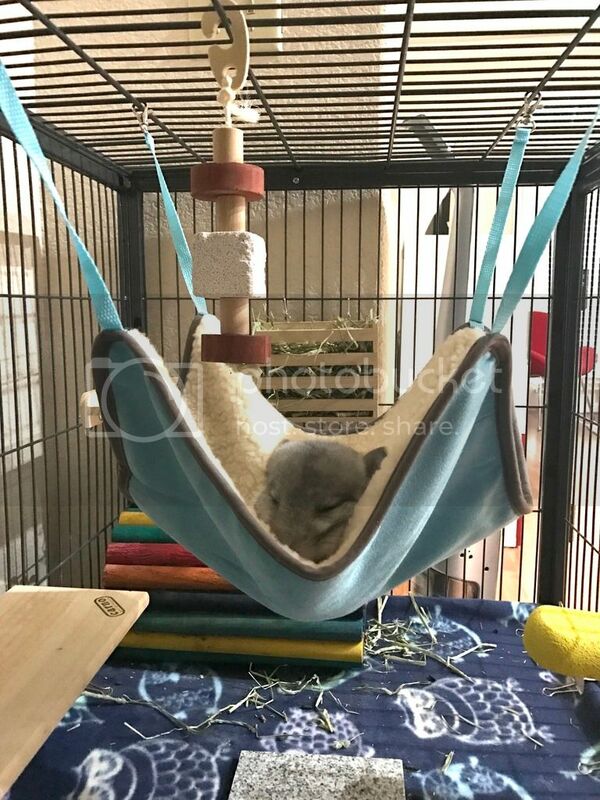 She sleeps in her hammock every morning! Tom will sleep most places - from what I can tell it reflects on how safe he feels. Hidey hut/house only when he's scared - he hasn't slept in it since the first week I had him. Ledges - majority of the time he sleeps on these. Anywhere on the floor - when he's really chilled out he's quite happy to stop and nap in the middle of the room, but he does sprint off if there's a sudden noise or movement.